A terrorist group called the Somali Pirates is located on the coast of the Gulf of Aden. Their targets to attack we’re againts the international ships. 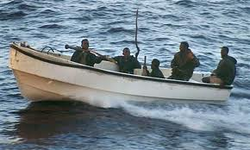 Somali Pirates don’t really wear eye patches and instead of swords they have RPG’S (Rocket Propelled-Gernades) They also use fast speed boats to get around and work in groups of 10 or so. Somali pirates usually attack at night.